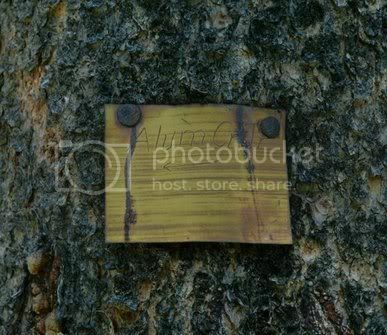 On a tree at the junction there was an old faded trail marker with handwritten ¡§„²Alum Cr. Tr¡¨. Given all the deadfall here we are lucky that this tree still stands. If this marker were face down we wouldn¡¦t know it existed. Ballpark kept assuring me that this was not the Mary Mountain ¡§east¡¨ trail, even though I kept saying ¡§Are you SURE?¡¨ Continuing generally west, we crossed an old well built culvert, coming to a meadow. Old meaning steel, not tile, built for auto traffic during the service road days. We went ahead to a meadow almost to the Highland Hot Springs vicinity, and clearly saw the road continuing. At this point in the day (after 4 pm!) we had to decide whether to keep going forward or go back. Remember, we are supposed to be working on a quick route in and out!